This review first ran in the Aug. 12 edition of The Hamilton Spectator. Here’s a true story about a toothpaste salesman who became one of the world’s wealthiest men. And there’s a lesson here for anyone who’s launching a business on James Street North or taking the reins at an established company with deep Hamilton roots. In 1982, Dietrich Mateschitz was a jet-lagged marketing director who’d just landed in Thailand. The locals took pity on Mateschitz and sent him to a store to buy a local tonic called Krating Daeng. It was a popular drink with laborers and long-haul truckers who needed to boost their physical endurance and mental concentration. The tonic worked its wonders and a refreshed Mateschitz dreamed of getting the drink in the hands of his fellow adventure sports enthusiasts back in Europe. He persuaded the pharmaceutical company that manufactured Krating Daeng to form a joint venture and introduce the world to the drink that roughly translated in English to red bull. 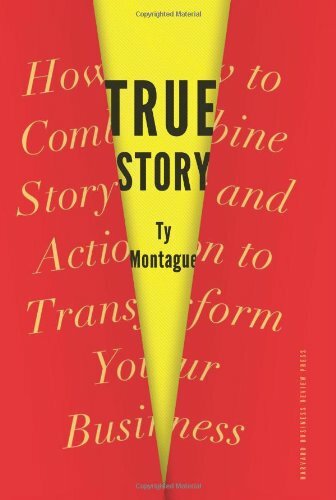 “It turns out that lurking inside the mild-mannered toothpaste salesman was an extraordinarily talented storyteller and experiential marketer,” says Ty Montague, the author of True Story: How to Combine Story and Action to Transform Your Business. So to engage his adrenalized friends, Mateschitz created the Red Bull Flugtag. Today in more than 35 cities around the world and before audiences of upwards of 300,000 spectators, self-taught pilots launch homemade aircraft off three-storey platforms and into bodies of water. Last October, Red Bull sent Felix Baumgartner into the stratosphere. The video of his 10-minute supersonic freefall has been watched 34.5 million times. Today, Red Bull is a mash-up of businesses. It’s a packaged-goods company. A media company, with a magazine and YouTube channel. It’s an events company. And it’s an adventure sports lifestyle company. As Montague points out, we are what we buy and we use our purchases to define ourselves as part of a tribe. We’re not just buying a Vampire Slayer pizza from Earth to Table Bread Bar, picking up a Fenwood Chicken Pie from Cake and Loaf and shopping for a gift at the Art Gallery of Hamilton’s Design Annex on James North. We’re buying stories and experiences that we then weave into our own narratives, wear like badges and talk about within our social and real world networks. A clearly defined metastory will help your current and prospective customers understand what your product means, how it can fit into their own personal metastories and why they should buy what you’re selling. The truth about the participants – the people who buy your products and services. What are their motivations? What are their personal metastories? When they buy what you’re selling, what are they telling the world? And how can you help them tell better stories? The truth about the protagonist – your company’s strengths and weaknesses, advantages and disadvantages relative to your competitors. The truth about the stage – the economic, technological, cultural and competitive forces swirling outside your company? What larger cultural narratives will affect the way your story is perceived? And the truth about the quest – the aspirational mission, higher ideal and human goal of your company. Answering these truths will lead you to a metastory that defines what you want to become as a business. “It has its roots planted firmly in the reality of your business today, but is meant to be both aspirational and directive,” says Montague. Now you don’t tell your company’s metastory to the world. Remember, Red Bull didn’t post a YouTube video of Mateschitz saying here’s my company’s story. You want to find your equivalent of a daredevil freefalling 39 kilometres and breaking the sound barrier. You tell your story through action that’s consistent and reinforcing. Think of your story as an instruction manual for your company. Use it to help you decide what products and services to launch. Who to hire. How to interact with your customers. And how to run and grow your business. Put your story at the centre of what Montague calls an action map. A clear narrative anchored in the four truths will help you decide what to start and stop doing and what to do more of to earn the loyalty of your customers and employees. it will also guarantee that you do what you say and deliver on your promises. Along with Red Bull, Montague looks at other storydoing companies like TOMS Shoes, Shaklee Corporation, De Beers and Grind. There’s also the cautionary tale of Hummer and what happens when your story no longer aligns with what people need to tell the world about themselves. “And so the brand died – as will any brand or business that ignores the importance of helping people do their personal metastory,” cautions Montague. So the future belongs to companies that know how to combine story with action and help people tell their own stories within their tribes. “Businesses that are passionate about making great experiences for people will win over time,” says Montague.